So, basically, if you’re comfortable installing a roaming camera, microphone and location sensing device in your home that’s designed to watch your every action, listen to what you’re saying and upload all this intel to the cloud to yield new programming instructions so the device changes how it acts around you in a pantomime of intelligence — this could be the artificial pet for you. Alternatively, you could make like Sebastian Thrun and become the proud owner of a real life puppy. 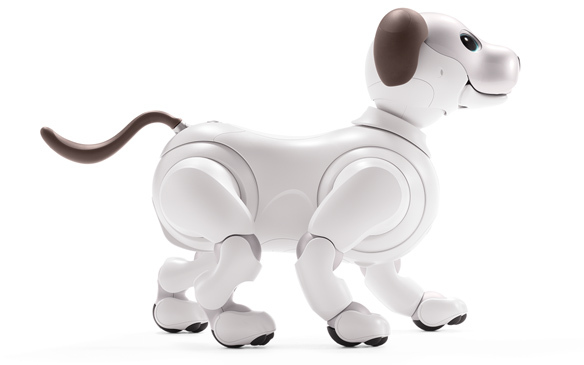 But if Aibo’s hairless lines and plastic smells are melting your heart, then prepare to shell out some serious yen: The Aibo robot itself is priced at 198,000 JPY (~$1,735) but you also need a subscription plan to connect to the cloud service that powers Aibo’s AI. A basic three-year subscription plan costs 2,980 JPY ($26) per month (or ~$790 if you pay up-front for the full three years). It also looks like Sony is limiting Aibo’s release to its home market — at least for now. It’s accepting pre-orders for Aibo from today, via its website, but won’t be shipping until January according to Reuters. Owners of the pet bot can also access an Aibo store via the companion app to shell out yet more money to buy additional tricks. Add on hardware accessories are also on the slate, such as a toy bone with a “tentative” price of ~$26. Aibo’s battery is good for two hours of activity before it’ll need a recharge on its charging mat (taking three hours to be fully juiced). Under its white plastic hood, the bot is powered by a 64bit Quad-Core CPU and is packing LTE and Wi-Fi:IEEE 802.11b/g/n radios for connectivity. On the moveable parts front, the robopup has 22 degrees of freedom. While its eyes are comprised of two OLED screens, hence enabling new Aibo to have a range of puppy dog looks. The original Aibo went on sale in 1999, with Sony going on to ship around 150,000 of the robots before production was ceased in 2006. Speaking at a launch event for its rebooted Aibo robopup today, Sony CEO Kazuo Hirai said: “It was a difficult decision to stop the project in 2006, but we continued development in AI and robotics.